Dental Sleep Medicine is an area of practice that focuses on the management of sleep-related breathing disorders including snoring and obstructive sleep apnea through the use of oral appliance therapy. Obstructive sleep apnea is a common and serious sleep disorder that causes you to stop breathing during sleep. The airway repeatedly becomes blocked, limiting the amout of air that reaches your lungs. When this happens, you may snore loudly or make choking noises as you try to breathe. This may happen a few times a night or in severe cases, several hundred times a night. In many cases, an apnea, or temporary pause in breathing of ten seconds or more, is caused by the tissue in the back of the throat collapsing. The tongue and muscles in the upper airway relax when you fall asleep causing the airway to narrow reducing the amount of air that can reach your lungs. When this happens, the tissues can vibrate and snoring occurs. If the airway becomes completely blocked, you may wake up many times during the night as your body struggles to get the air that is needed. Sleep apnea can cause you to wake up feeling tired or unrefreshed even though you have had a full night of sleep. During the day you may feel fatigued, have difficulty concentrating, or you may even unintentionally fall asleep. This is because your body is waking up many times during the night even though you might not be conscious of it. Sadly, people with untreated sleep apnea are twelve times more likely to be involved in an auto accident. Tired driving is the #1 cause of car accidents, statistically more dangerous than drunk driving. Sleep apnea must be diagnosed by a physician who is trained in the field of sleep medicine. This will include an in- lab sleep study or a home sleep study. Once this is done and a diagnosis made, treatment will be recommended based on the severity of the disease. CPAP (continuous positive airway pressure) is the frontline method of treatment recommended for most patients with moderate and all those with severe sleep apnea. CPAP delivers a steady stream of air to gently keep the airway open at night so you can breathe normally. It is effective, however, many people are not able to use it nightly because it is bulky and can be uncomfortable. Some people also feel claustrophobic wearing the mask all night. An oral appliance is a device that fits in your mouth over your teeth while you sleep. It keeps your tongue and lower jaw in a forward position helping prevent the airway from collapsing. 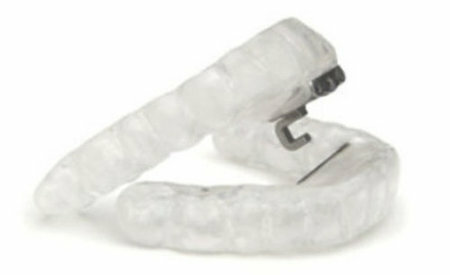 An oral appliance is recommended for individuals with primary snoring, mild and moderate sleep apnea and for patients who are unable to tolerate the CPAP machine. There are several different types of oral appliances available. If your physician has recommended you be evaluated for an oral appliance, we will discuss all details with you. There are several different designs of appliance that can be made, and your input in making this decision is essential. We want to select an appliance that will be effective as well as comfortable for you to use each night. After a thorough examination, we will construct a custom fitted oral appliance for you. We continue to adjust (titrate) the appliance until you benefit from it fully. When you feel better and your quality of sleep has improved, you then return to your sleep physician for a detailed evaluation of the effectiveness of the oral appliance. These are other excellent sources of information about sleep disorders and dental sleep medicine. 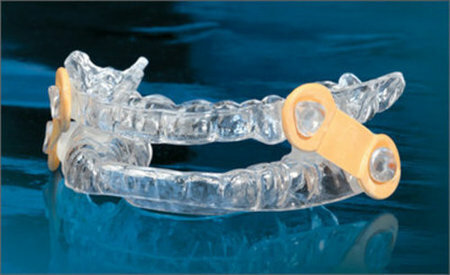 Here are examples of two oral appliances used to treat snoring and sleep apnea. Continue and check your risk factors for sleep apnea.